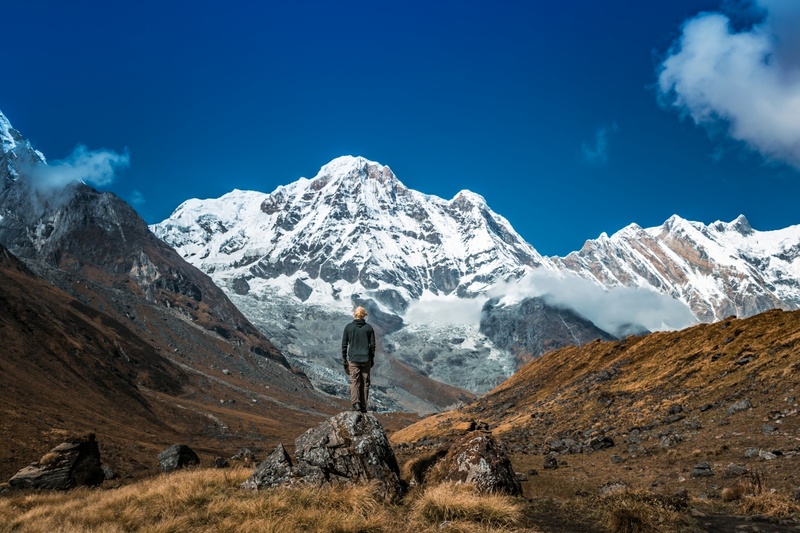 Admiring the great mountains of Annapurna mountain range in Nepal. Yep, that is me standing on a rock on the way to Annapurna Basecamp in Nepal. We left for final day trek from Machapuchare Basecamp to Annapurna Basecamp really early in the morning to catch the mountains with clear blue skies. Usually they become covered in clouds around noon. That’s the way weather works up there. The views were absolutely magnificent and I’m not sure why but the Himalayan sky is as deep blue as you can imagine. Tip: If you go trekking in Himalayan mountains don’t make your schedule too tight so that you don’t have any extra time to just sit around and just admire the scenery around you. AND after 3000 meters it’s important not to climb over 400 meters a day to avoid altitude sickness.